Dedicated to Conservation and Open Space. Beverly Equestrian (through its owners) has placed its farm in a perpetual conservation easement with a donation to the Land Trust of Virginia (http://www.landtrustva.org/index.htm). Recognizing that the loss of open land is a great and urgent threat to the future of equestrian activities, Beverly Equestrian’s donation is a vital step towards preserving open space for equestrian use in The Plains, Virginia. Although primarily designed to prohibit subdivision and limit development, the easement goes further to protect the landscape by implementing enhanced screening measures and adopting multiple low-impact environmental practices. 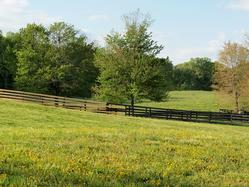 Working horse farms often must sacrifice scenic beauty to allow for necessarily large and utilitarian outbuildings. To avoid this result, Beverly Equestrian has instituted a strategic farm-building plan and taken multiple steps to preserve the beauty of the surrounding area. First, by nestling its existing structures into the topography, placing tree saves on bordering tree lines, and creating sweeping land berms, Beverly Equestrian has endeavored to protect the view sheds of nearby scenic byways and neighboring farms. Second, it has instituted a master plan to limit the number of agricultural and other structures on the property and to restrict future buildings to remote or screened areas. This strategic planning enables farm construction to be efficient and limited in nature. But visually minimizing farm structures is not enough – these structures often have a negative impact on the surrounding environment by creating impervious surfaces and high volume rainwater run-off that can denude and degrade the surrounding soil and watershed areas. To avoid this undesirable byproduct, Beverly Equestrian has designed a low-impact environmental plan. For example, the farm employs a commercial-grade water tank to capture nearly all of the rainwater run-off from its indoor arena and barn, which is then recycled into the irrigation system to maintain the derby field and outdoor sand arena. Beverly Equestrian has also installed permeable surfaces and drains in its courtyard, pathways, and sand arena. In addition, Beverly Equestrian has instituted steps to protect its wetland areas and has already planted dozens of indigenous trees and horse-friendly plants. To read more about the importance of preserving open space for equestrian activities, please visit the Equine Land Conservation Trust (www.elcr.org). Beverly has install EquiLumination Equine Lighting in all aisles and in its indoor arena. EquiLumination specializes in lighting for equestrian facilities and helps provide a cost effective and green energy efficient, lighting solution for all types of horse barns and riding arenas. EquiLumination not only provides light solutions, but does so by designing energy-saving and maintenance-free systems. In fact, Beverly’s indoor lighting uses half the electricity of conventional lighting systems. Beverly beds with premium Guardian products. The Gold Standard small flake shaving product offers incredible absorbency and siftability, but with the aesthetic of a true pine shaving. Guardian Gold is multi-screened to control dust leaving only the clean, beautiful, functional small pine flakes. In addition to being a perfect selection for clean and comfortable stalls, this product is highly compostable, which contributes to the overall environmental health of the farm. Beverly is proud to feed grain produced by locally-owned business, Tri-County Feeds, Etc. TCFE Horse Feeds is an equine feed line specifically developed to benefit the horse industry of the Northern Piedmont region. TCFE teamed up with the nutritionists at McCauley's Equine to formulate and manufacture a line of feeds that would address the needs of the horses (and horse owners) in this very special region. TCFE Feeds are produced in a drug and medication-free, equine-only feed mill, made fresh to order, packaged in an environmentally-friendly "Bag within a Bag" that allows for easy separation of the inner liner from the outer paper shell so that both can easily be recycled, and offers outstanding values in equine nutrition. And as an added benefit, TCFE donates a portion of the proceeds from the sale of TCFE Horse Feeds to the conservation and preservation efforts of the Goose Creek Association (www.goosecreekassn.org) and the Piedmont Environmental Council (www.pecva.org).